After their maiden win last weekend on the road at Phoenix, the 12 boys were hopeful of grabbing some competition points against another team that had also only had success once this season (also against Phoenix). The first half didn’t go to plan with the defensively well-structured visitors blocking all paths to goal and managing to score on the counter twice. The second half saw the boys adjust their approach and they were able to find a way through the Crusaders defence on a number of occasions, allowing for two goals to be scored. Unfortunately, they leaked a third which meant to points went to the visitors. They will now look to grab some wins in the second half of the season and cause as many upsets as possible. The 13 girls continued the good form which has been building nicely over recent weeks. Their solid performance started a great day for the Boomerangs female teams that saw them win all the games contested – and quite comfortably. The girls have now hit the top four for the first time this season and will look to consolidate and improve that over the second half of the season – with the benefit of five home games from the seven to play. This win was a great team effort resulting in some terrific goals. Both teams in the 14 boys match were looking to secure their first win of the season, with both winless from the first six rounds. And whilst neither team had managed a win, the Boomerangs for and against record was superior. From the starting whistle, the boys played with intent and purpose, no doubt believing they had an opportunity to win the match. They put together some great plays across both the first and second halves and constructed their goals nicely. This was a good win for the boys and one which will no doubt give them some confidence going into the second half of the season. The 15 girls are now in the position where they want to protect their top spot on the ladder and preserve their undefeated status. They started the match solidly, dominating in all facets of the game, and neatly slotted three goals in the first period of play. The second half saw them consolidate their first-half effort and look to control the match and play it at their own pace. Their priority was to keep a clean sheet and ensure the visitors could gain no momentum from which they could build. A single second-half goal gave the girls a comfortable 4-0 victory and sees them just two points ahead of a couple of challengers going into the back half of the season. The Crusaders 16 boys are their strongest team and were sitting in the top four, not far behind the Boomerangs, after the first six rounds of competition and it was expected that this would likely be the toughest match of the day. And the competition rankings certainly gave an indication of how the match was to be played, with the visitors having a strong first half – resulting in them slotting home two goals to the home team’s single. The Boomers 16s though picked up their work rate in the second half and took on the tactical adjustments Coach Dowling wanted to see. The results were positive with the home side slotting home four second-half goals whilst effectively defending the back end of the court. Goals at the 24th, 33rd, 37th and 40th minutes ensured the three competition points remained with the Boomerangs 16s and they too (like the 15 girls) retained their undefeated status on the competition table – lifting them to top spot after seven rounds played. The Boomers 18 women’s team started this match well and dominated both halves, but were effective at scoring only in the second half. And it was not like they did a great deal differently in the second period, they did though, became more purposeful going forward and ruthless in front of goal. At the halfway point of the season, the 18s find themselves just out of the top four a single point behind the other three teams all vying for positions 2,3 and 4 on the ladder. 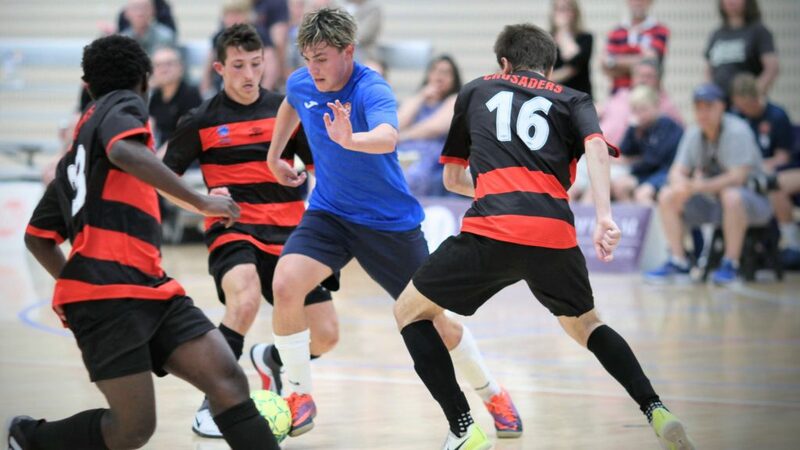 Raiders Futsal clearly lead the title race with seven wins from seven played. To improve their standings across the second half of the season the girls will need to grab home wins from the three teams that they were defeated by on the five away trips in the first half of the season – in addition to winning the two remaining away rounds of the season. Like most youth men’s matches, this was a great game to watch with plenty of talking points afterwards. The Boomerangs youth got off to a great start in an end-to-end affair that saw plenty of goals and saw them take a narrow single goal advantage into the half-time break. They dominated the first period of the match without scoring but were first to hit the scoreboard half-way through the first period of play. The visitors hit back almost immediately through a well-taken corner, to start a period of ‘trading blows’ with the Boomers taking and holding the (3-2) lead they locked in at the 18-minute mark. The second half saw the Boomers grab a two-goal advantage with Luca Macor grabbing his second just a few minutes after the resumption. From there the teams continued to trade blows until the Crusaders, with control of the match momentum, scored twice and levelled up the scoreline at 4-4 in the 38th minute. The final ninety seconds of the match saw the visitors take the lead through a well taken free kick from a narrow angle. From the restart, the Boomers went purposefully forward with Jayde James-Ward scoring with the final kick of the match; the audible time clock buzzer, the referee’s whistle, and the immense crowd noise all a blur. The draw sees the youth drop to 3rd on the competition ladder, which typically for the youth age group, has all teams still in the mix for finals futsal at season’s end. What can be said about the Boomerangs women that has not already been said this season so far? Another match, and with quite a few personnel changes on the court, the Boomers open women once again knocked up an impressive victory by a substantial margin. The team is full of confidence, regardless of which players are on the court, and they have an abundance of scoring threats across the court. This week it was Alex Martens, returning from a layoff, who hit the back of the net three times, while the ever-reliable Maddie Perceval also grabbed a double. The team now has fourteen goal scorers for the season, with three of the top six, from the 18s. But more importantly, they have a tremendous defensive record, conceding only seven goals across the first half of the season. A significant test for the women will be the next two rounds – against Raiders and Taipans, teams that occupy second and third spots on the competition ladder. The Boomers men’s match was again another cracking match that produced as much excitement as the youth men, but with a higher degree of control and defence. The first half saw end-to-end action, with both teams frustrated by the others’ defence. Both teams had chances, but none were converted as the sides went into the break at nil all. The Boomers opened the match scoring in the second period with a beautifully worked goal with sublime passing between Ciminelli and Basser that saw Ciminelli neatly finish in the 34th minute. Behind, with the clock counting down, the Crusaders lifted their work rate and converted a scoring opportunity in the 40th minute. Now with the match momentum with them, it felt that they would be the next to score, and so they did, in the 48th minute to take the match lead for the first time. Much like the youth men’s match, it came down to the final ninety seconds, as the Boomers abandoned their goal keeper to play with a fifth man on the court. Some patient offensive movement was rewarded in the dying seconds when Ahmed Ugool slotted home from close range, directly in front to rescue a point from a match they probably should have won. Next weekend sees the club take on fellow Club-Championship aspirant Raiders Futsal at home at the AIS. The two clubs are well matched across all age groups and the results from this round will be crucial in providing momentum and belief for the club going into the back half of the season. And at the halfway point of the season, the Boomerangs club has surged from mid-table to top the very congested PL2 Club Championship. There remain six clubs in contention for the ultimate position on the table and promotion to PL1 with less than three wins separating top spot from sixth.